The Health Professions Scholarship Program (HPSP) allows qualified recipients to earn a full-tuition scholarship, plus a monthly allowance, to attend an accred veterinarian school in the United States. Direct Commissioning is offered to all graduates of accred schools of veterinary medicine in the United States who are U.S. citizens. The maximum age is 42 at time of accession. ^ "Once upon a time". 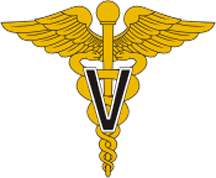 Association of Retired Enlisted Veterinary Personnel. 2009. Retrieved 2014-05-06.